Stored value now available at TAP website and on all ticket vending machines! Over the past couple of months, Metro customers have been able to add stored value to their TAP cards at 22 ticket vending machines at Metro Rail stations. The test of stored value has gone very well — so well, in fact, that Metro today is selling stored value at all ticket vending machines in Metro Rail and Orange Line stations. The machines will allow customers to add stored value in increments of $10, $20, $40, $80, $100 and $200. Cards also remain for sale at 22 machines — here are their locations. In addition — and just as significant — the taptogo.net website now allows customers to put increments of $5, $10, $25 and $50 of stored value on their TAP cards (sign in, click on ‘fare products’ and then the arrows next to “fare description.’) This is especially convenient for those who don’t take Metro Rail and don’t have easy access to the ticket vending machines. The uber-alert L.A. Streetsblog site already seems extremely happy about this according to their post yesterday. Stored value allows customers to put cash on their TAP cards and have the cost of single rides automatically deducted whenever they take the bus or train — just tap your card at the gate and go. It’s very convenient for Metro riders who don’t want to hassle with buying paper tickets before each ride, especially those who don’t ride enough to justify buying a daily, weekly or monthly pass. Please bear in mind that this is still officially a test of the TAP system. Please feel free to provide feedback by leaving a comment with this post or emailing us at sourcemetro@gmail.com. Metro is also working to eventually allow stored value to be added at vendors who sell TAP cards around Los Angeles County. That effort will be spread out over the next several weeks. Once available, you will be able to load increments of $5, $10, $15, $20, $40, $50, $80 and $100. A special note of caution: all TAP card riders are reminded that they are REQUIRED to tap when boarding all trains and buses. If you are stopped by fare inspectors, you will be cited if stored value cards that had not been ‘tapped’ will be cited. It is not sufficient to have “cash value” on the card – you MUST TAP with each boarding. And why does this have to be announced on April Fools Day? Ah well. Hopefully “you still need to TAP even if you have cash value” warning can go away QUICKLY. I don’t find it very convenient if I have to wait 2 days to use my newly added cash value card. Like I said on Streetsblog, The system should let me log on from my smart phone, check the balance on my card and add value whilst I wait for my bus to arrive. When leaving rail stations, sometimes a fare inspector will have you tap your card to a vaildator to show that your card is valid. Does this mean we are going to be charged another fare upon leaving the system too? What about day passes? Will stored value be recognized as a day pass when a rider rides say 5 different buses and trains in a day? Or will it take $1.50 off the card every trip ridden? And what about on line purchases of day passes? Will the TAP system now offer this option? Next up, learn from other transit agencies. Boston’s CharlieCard provides incentives for Bostonians to start using the CharlieCard over paying cash by giving extra discounts per ride for tapping onto buses and MTAs using the CharlieCard. Right now there’s not much incentive for one to do so for TAP since all we see is LA Metro getting cost savings and no incentive for Metro riders. Suica allows compatibility with other transit agencies all over Japan not just Tokyo. Would like to see TAP be compatible with SF’s ClipperCard and SD’s CompassCard without having to carry three different cards for SF, LA and SD. What’s the easiest way to check the balance of your TAP card? I’m an occasional MTA rider, but wouldn’t mind having some spare transit fare in my wallet just in case. However, I’d probably forget how much is on it if I haven’t used it in a while. Can you check it on the web? On your smart phone? And can you add a day pass to it? I agree with “the dude abides” that it doesn’t make much sense if the value isn’t added at the time of purchase. @Brian No they are merely checking that you did TAP on the validator, the info shows them the last time you TAP’d and what kind of fare was used (whether it be a pass or stored value) Remember this is a SMART card that is used in systems all over the world. Metro has been implemented these systems just recently so we aren’t used to the functions yet. Pssst Metro (Do What The Bay Area Did with Clipper!) their system isn’t perfect (Whose is?) but they have the problems you seem to encounter with TAP sorted out. 4. You should see a section called “Value Remaining” which shows how much you have stored in your TAP card. Could be made easier if it shows the balance at Step #2, but it’s there. I wonder how many months it will take Metro to say this was an April Fools joke. All kidding aside, is there separate stored value for each system? Is my Metro money good on Culver City Bus and vice-versa? Or is money not fungible in transit land? 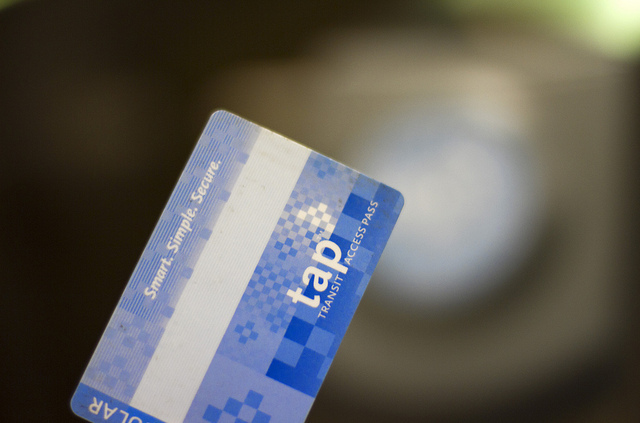 Yes, your TAP card is good for all transit systems that uses TAP. So if you top up $20 on taptogo.net, it’ll be good on Metro, Culver City Bus, etc. I’ve topped up my original TAP with $20 cash value at Culver City since inception and it was good at all transit agencies from Metro to the Santa Clarita Valley Transit. I still have $10 left in it when I checked online. It’d be nice to have ride history show up like Suica and HK’s Octopus Cards too though. I use the North Hollywood station to load cash value for Santa Clarita since it is self-serve so yes money is fungible just not the passes. The stored value money works on all the tap systems, no matter where you added it from. How can we load stored value for commuter program transit vouchers?